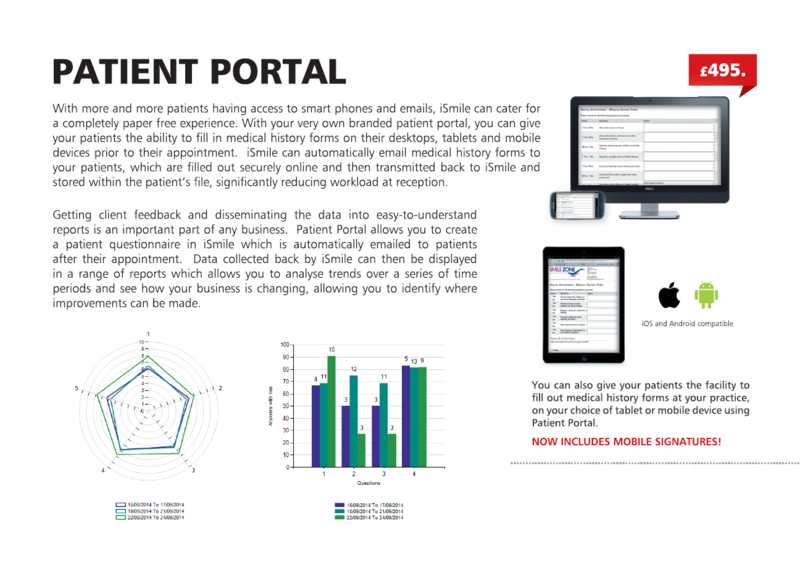 Managing your patients is made simple through iSmile’s centralised patient module. A user-friendly menu system combined with mouse point and click functionality supports users to maintain patient information, dental charts, financial statements, appointments, communications and important alerts. iSmile’s proprietary diary functions give users clear views on the day, week or month. 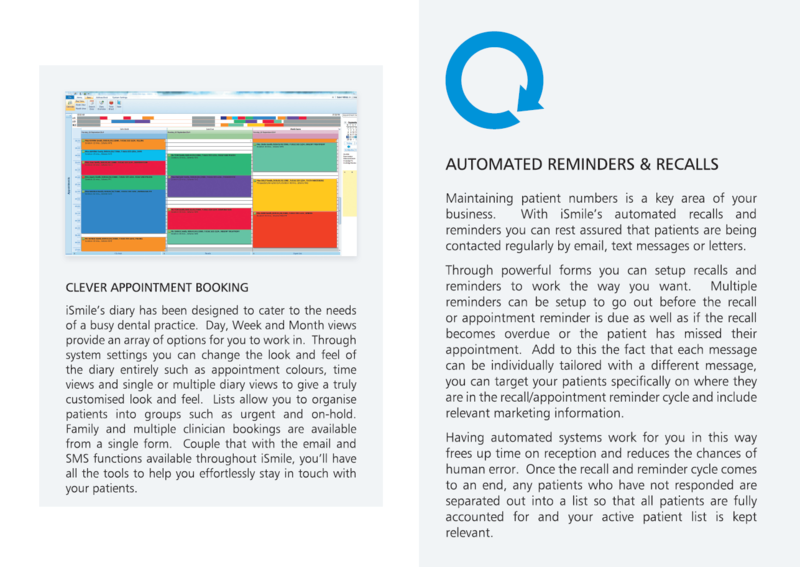 A mini summary day view allows users to view their day at a glance and interacts with the main calendar for easy and quick navigation and allows the diary to automatically pick up information for patients who require appointments. 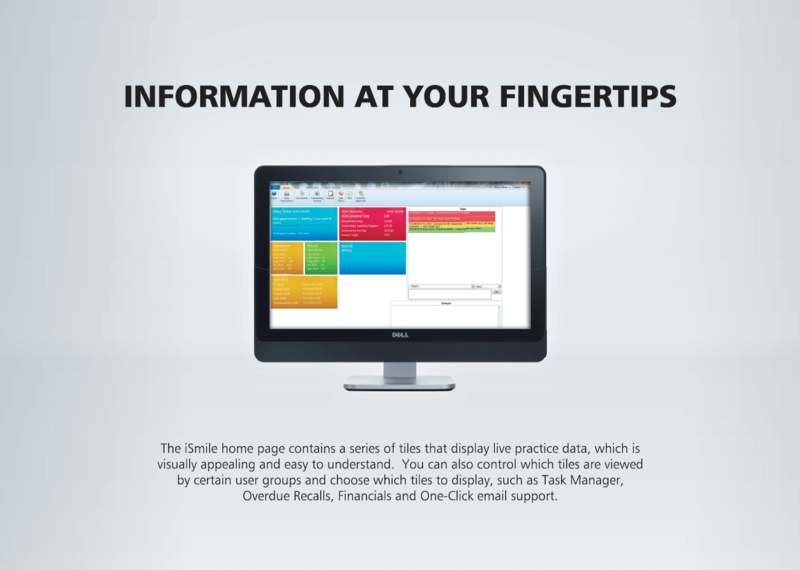 iSmile has a vast array of management tools, which allow the user to manage staff and practice tasks efficiently. Daily revenue generated is displayed in a simple and clear format allowing the user to view sales, expenditure, net and bankable amounts. Surgery Live informs appropriate users when patients have arrived at the practice, listing them and allowing you to track their progress throughout their time at the practice. Linked to the patient module, users can jump to a patient’s record to carry out any work without having to search for them manually. Part of effectively managing a dental practice involves the responsibility of gathering data and drawing out valuable information. 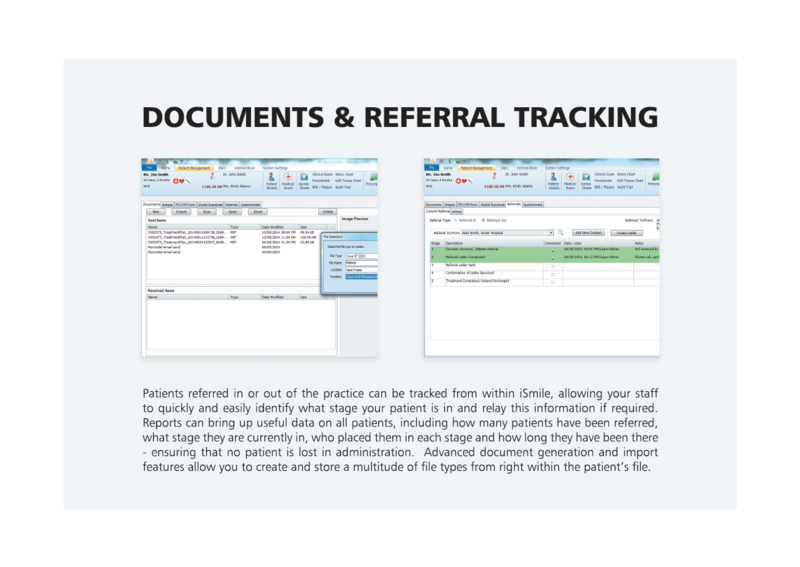 iSmile handles this by offering a wide range of reporting tools to help you produce detailed patient and practice information. Linked to the automated patient recall alerts, text messaging capability allows users to send multiple SMS’s to patients who are due recalls via the single click of a mouse button. 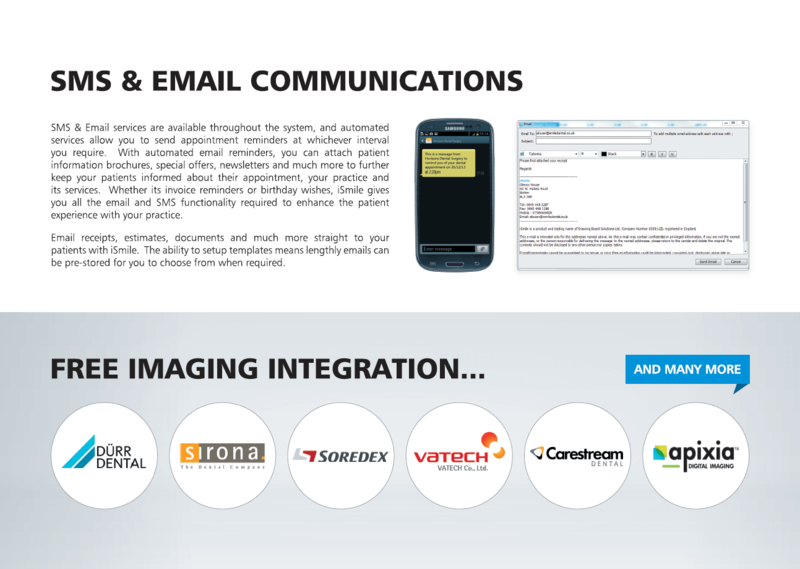 Furthermore SMS and email messages can be sent using patient lists generated by iSmile for marketing purposes. 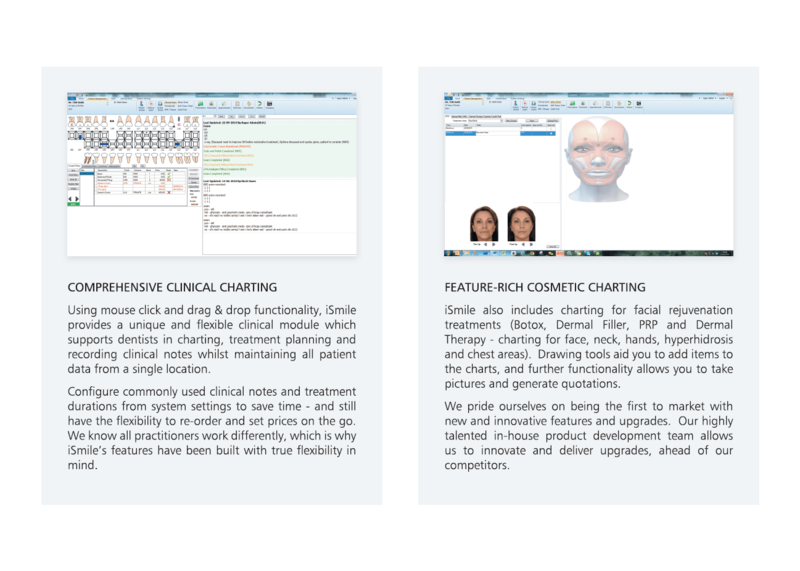 Using mouse click, drag and drop functionality, iSmile provides a unique and flexible clinical module which supports dentists in charting, treatment planning and recording clinical notes whilst maintaining all patient data from a single location. Configure commonly used clinical notes and treatment durations from system settings to save time – and still have the flexibility to re-order and set prices on the go. We know all practitioners work differently, which is why iSmile’s features have been built with true flexibility in mind. iSmile also includes charting for facial rejuvenation treatments (Botox, Dermal Filler, PRP and Dermal Therapy – charting for face, neck, hands, hyperhidrosis and chest areas). Drawing tools aid you to add items to the charts, and further functionality allows you to take pictures and generate quotations. We pride ourselves on being the first to market with new and innovative features and upgrades. Our highly talented in-house product development team allows us to innovate and deliver upgrades, ahead of our competitors. 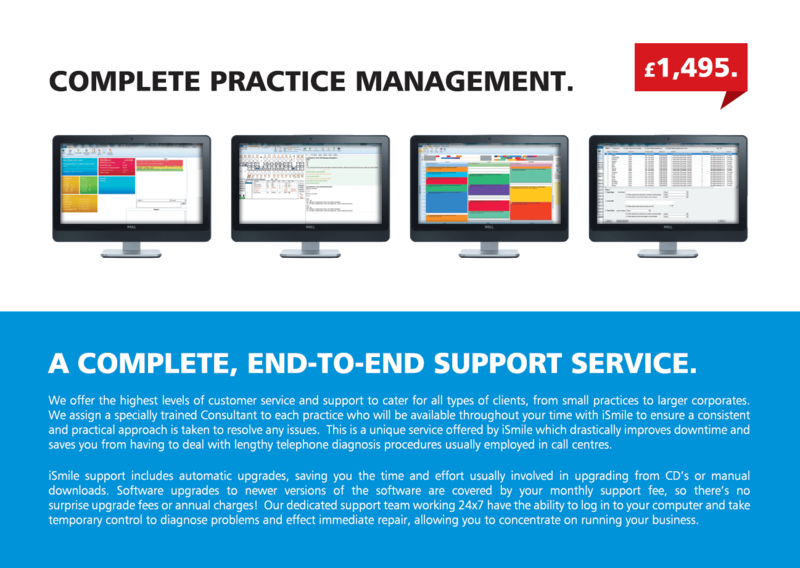 Maintaining patient numbers is a key area of your business. 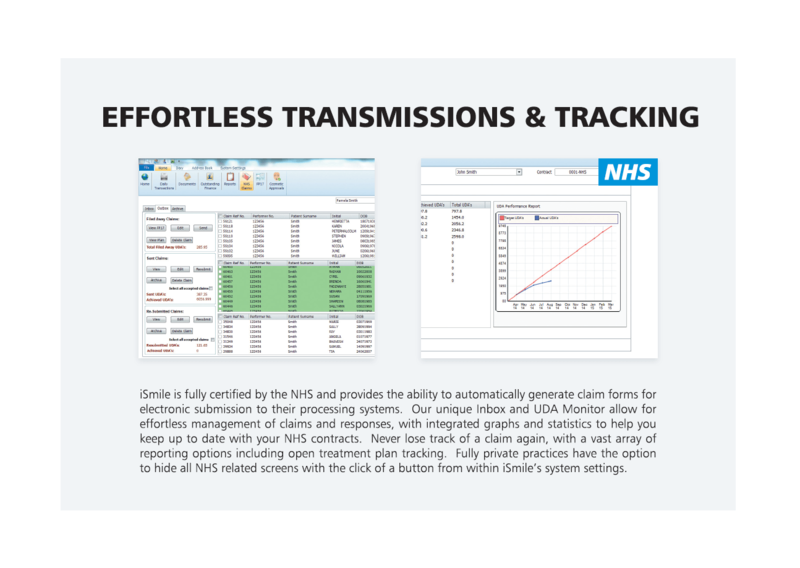 With iSmile’s automated recalls and reminders you can rest assured that patients are being contacted regularly by email, text messages or letters. Through powerful forms you can setup recalls and reminders to work the way you want. Multiple reminders can be setup to go out before the recall or appointment is due as well as if the recall becomes overdue or the patient has missed their appointment. Browse through some pages from our brochure or request a hard copy by visiting our contact page.